Did you know you could export your calendar with Cities Reference? 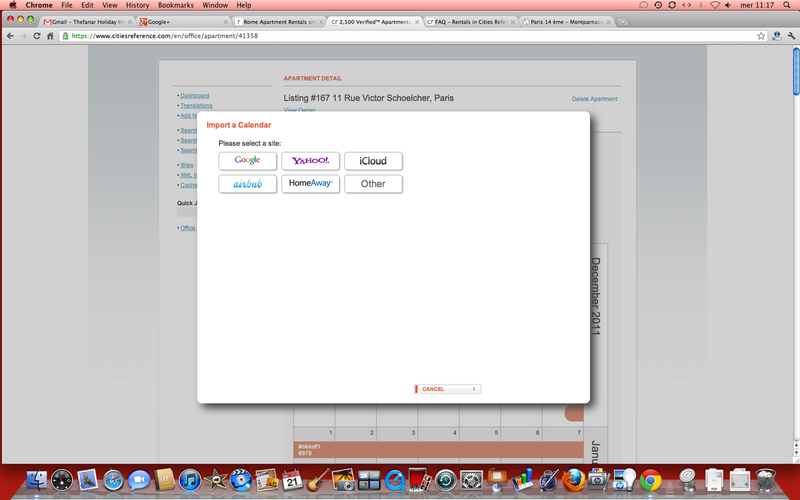 It takes the time of a copy and paste and it allows you to update just one calendar for all the websites you're using. This is going to make your life a whole lot easier and allow you to activate your instant booking with us which multiplies 10x your bookings. 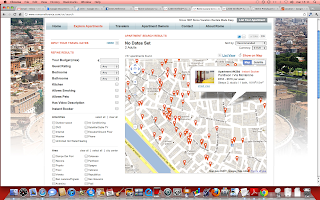 Are you using the map view when searching your rental apartment? This is a great tool that will give you total control of the area where you want to be located. 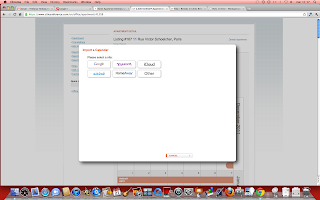 It will show you only the apartments available in your time frame and its cost. You can seamlessly go from map to apartment description and booking. Check it out here: explore the apartments and click on 'Show on map'. We weren't able to complete the last update. Analytics: Our 6th site on traffic, up two positions, just below Copenhagen Reference by a few units. Time on Site is well above average at 67% of RomanReference's speed or 32.8% lower. Same goes for the Bounce, better than Paris and better than average. Booking/Instant Ratio is 12.5%. Great numbers well worth further investment. Madrid Apartments 58. Rank 0. Instant Ratio is 64%. Waste ratio is 1.7%. Availability 5,3% (13%). Prague Apartments 63. Rank 0. Instant Ratio is 98.4%. Waste Ratio is 0. Availability Rate is 8%. Three months on we feel pressed to update. City sites are now 18, with just a 6% growth (notably and finally Amsterdam rentals), but the main improvement is on sites like A'dam itself and Dublin now featuring decent numbers of apartments listed. Apartments are now 2,069 keeping the pace shown with the last update and growing 55%. With 751 Instant Booking apartments the ratio is now gone down to 36.3%. Still very reasonable. Last but not least New York is finally also a .com and not just a .co.uk. And now a look at the details. 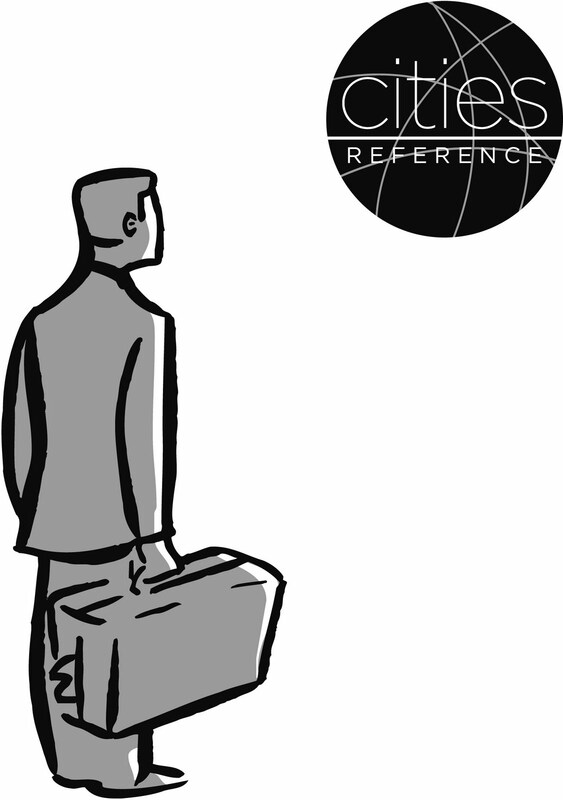 Cities Reference features an Alexa of 66,000 (growing 3% in traffic). On Analytics traffic is stable at 32% of Roman Reference; traffic month on month is down 8%, year on year though - which is what really matters - gains yet more speed at 862% growth! Time on Site 9,02 and Bounce 36.7% are as usual the best of all. One note here is necessary. 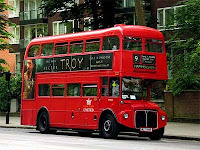 Since the overhaul last March/April 2011 the parent site -Cities Reference- has become the venue of mostly owners as opposed to the single city sites which gather mostly travelers. Different behaviors here reflect well our underlying strategy of envisioning owners as partners in business and travelers as clients. No wonder apartment owners show a higher level of stickiness to the site. Other than that it must be stressed that time on site has been growing a robust 12.5% compared to the last update, while bounce has remained largely stable. Stats: with Alexa of 62,000 (growth 6.5%) is performing at one of its best standards ever. Gathering distance from Cities Reference despite our prediction. Analytics keeps pace from all the other websites. Growth year on year slows down slightly to +11%. Month on month is down 11%. Bounce and Time on Site: at respectively 38% and 6.05min are really good for a traveler centric kind of site. Rome Apartments: with 751 apartments it keeps growing 13% from update to update, it's a 50% growth if annualized, so very robust considering this site can by all means be considered mature at this point. Visitors Vs Apartments/month: 20.1 so slightly improved, this is the best metrics when looking at traffic. 49 is the ratio for Instants. Conversion: on Ecommerce is 1.57% which is 3.2X compared to the industry average. We'll track growth on this from now on. Conversion on online bookings is 79.7%, lower than average, which is odd for a low season period, this is likely due to October that, being highest season, has received a lot of last minute bookings for On Request apartments. On the other hand November is too slow to make up for it. Booking requests: 879 in line with the low season tide. Client Reviews: 2,276 we'll start checking its growth from now on. Analytics: Still third website at 12.6% of Roman Reference's and 40.4% of Cities Reference's speed and keeping the 4th site (New York Reference) at 17.7% of its speed, so the traffic measure is comparatively not bad, although the year on year measure stays put in red at -3.9%. Time on site is 42.4% less than RR (not great and worsening) and bounce is 45.7% higher (ouch bad metrics in Paris!!). Apartments: Still 3rd with an amazing growth rate of 96%! This measure largely makes up for the previous when looking at the future. Visitors VS Apartments ratio/month: bound to drop dramatically with the recent flow of apartments: 5.3, although it keeps stable for Instant apartments at 53 per apartment. A note here is due. 53 per Instant apartment is higher than Roman Reference therefore worth noticing. Instant apartments in Paris are getting booked out faster than Rome and they are likely what determines the dismal figures for time on site and bounce rate. Working on the Instant figure in Paris becomes the key to success. Instant VS On Request: Down 50% with just 10.2%, ouch! Conversion on Bookings: it's 0.87% on ecommerce, still better than industry average but almost just half of Roman Reference. Conversion on online bookings is 62.3%, which is good in general and improved lately despite the bad numbers above, which again comes to demonstrates that this site needs at least double the ratio of Instant Apartments to start delivering. Bookings are just 7.5% of Roman Reference, so... going down. Still by far our second site in terms of booking requests. New York Reference: A lot of things have improved in New York. Finally a .com for it, finally the USD as the main currency, finally our team on visit to the Big Apple to promote it for good, a lot more apartments! Alexa: at 1,035,000 is up 132%. Analytics: Shows it up one to our 4th position. 2.2% of Roman Reference so slowing a little on that measure. Time on site is 41% lower than Roman Reference, so improving consistently and getting to be slightly better even of Paris. Bounce is 13% worse than RR, so again a lot of improvement and a lot better than Paris Reference. Apartments: It's now our third on apartments, up 5 position. With 149 apartments it grew 224% after our trip to New York. Visitors VS Apartments: It's 2.2 which doesn't surprise with a sudden growth of 224% on apartments. The real measure to look at is towards Instant Booking apartments where it has 36.5 visitors per apartment which is rather good actually. Instant Ratio is 6%, so 3X better than the last update, clearly the visit to NY brought reaped some interesting results. Booking requests: Easily our third site in terms of booking requests with 1.6% of RR and 24.5% of PR. Not bad. Conversion on booking requests is 7.7%. Analysis: New York, in spite of recent legislation against vacation rentals, pulls a lot of weight and has a lot of potential. Two months on a lot has happened, especially East of Europe Warsaw, Krakow, Prague and Belgrade apartments are now listed, even Apartments in Venice are kind of East after all.) Sites listing vacation rentals (that is not blogs) are 17 therefore a whopping 70% up compared to our last post. Apartments are 1,333 compared to just 860 (55% growth). Most importantly the ratio Instant Vs On Request apartments has jumped to 46.2%! A productive couple of months indeed! Cities Reference confirms its parent site status with 68,000 alexa (basically stable), disk usage is 4 times lower than Roman Reference still yet 6 times higher than the third ranking website (Paris). Analytics ranks it our second site in traffic twice more traffic than Paris Reference and stable at 33% of Roman Reference speed. Traffic is unsurprisingly down (7%) month on month (this is low season) but it's gaining speed on a yearly basis at 627% growth. Alexa 66,000 is down 10% in two months (which comes with low season) and meeting with Cities Reference in the middle, this was bound to happen and likely Cities Reference should pass Roman Reference soon since it's become the general hub the previous used to be. Analytics still the highest (66% more traffic than the 2nd best - 10 bookings everyone made by the second best). 14% growth in traffic year on year. Apartments: With 667 apartments it has grown 13%(!!) compared to two months ago and almost 45% since May 2010. That seems to show a hell of an acceleration since its annualized rate, if it kept the pace is 156% almost 300% faster than last year. Visitors Vs Apartments Ratio: 19.5. Considering only Instant it's 48. Instant Vs On Request: Also the Instant ratio is improving sensibly with 41% compared to 38% only two months ago. Booking requests: 887/Month, the slow down is pretty normal in low season, although 26% is double the slump in traffic. Alexa 127,000 is down 13.5% with low season and still firmly our third website. Analytics: our third site on traffic still faring at 16% of Roman Reference's speed, time on site is 40% lower than Roman Reference and bounce 22% higher so there is improvement in all measures. Year on year traffic is also improving to just 3.8% slower than last year. Apartments: It's still our third website on apartments although the competition seems to be gaining speed. With 175 apartments it grew 9.4% in two months, so half the speed of Roman Reference and nothing compared to the speed of the developing websites below. Visitors Vs Apartments Ratio: 11.5. Considering only Instant it's 54. Altogether a reasonably good picture compared to two months ago and taking the season into account. Analytics: It's our 6th site on traffic (1.8% of RR, slowly gaining field) so it's up one position, time on site is 61.9% lower than Roman Reference (so improving), bounce is 33% higher (stable). Visitors Vs Apartments Ratio: 3. Considering only Instant it's 5.1. Instant ratio is 59.7%!! A stunning growth. Booking Requests/Conversion ratio is 50% double last time, as for booking requests is 4th on our site 0.45% of RR this is also improving. Analytics: It's our 7th site on traffic (2 down, 1.48% of RR, so going down), time on site is 56% lower than Roman Reference (improved) and bounce rate 20% higher (improved!). Year on year traffic is up 48.68%, that's a great figure! Apartments: It's our 4th site with 71 apartments, so up two positions and up 163% compared to only two months ago. One of the biggest velocity we got. Visitors Vs Apartments Ratio: 3.3. Considering only Instant it's 5.4. Instant Vs On request ratio has come to a flattering 60%! Booking Requests/Conversion ratio are too low to mention, the booking requests are plenty though, by far 3rd site. Analysis: the fundamentals of Barcelona are now in order we only need to bring in some traffic. Analytics: It's our 10th site for traffic (stable, just .66% of RR, so going down in measure) time on site is 62% lower than RR, bounce is 9% worse than RR. So here there is a big jump in improvement. Apartments: It's our 6th site for apartments (up 1 position), with 48 apartments it grew 243% in two months, the fastest website growth we got. Visitors Vs Apartments Ratio: 2.3. Considering only Instant it's 3. Booking Requests/Conversion ratio is Nil. This is just gone live but it runs pretty fast. 3,193,000 on Alexa and 47 apartments, all Instant. Analytics: It's our 5th site on traffic (up 1! 2.66% of RR so improving quite a bit), time on site is 59.2% lower than Roman Reference, bounce rate is 20% higher. Kind of stable. Apartments: It's our 8th site for apartments, down 5 positions. Hardly surprising since we're growing in the Euro area mainly. With 46 apartments it grew a meagre 5% in two months. Visitors Vs Apartments Ratio: 10. Very good rate for a developing one. Instant ratio is 2.1% and Booking Requests/Conversion ratio is too low to mention, as for booking requests though it's our 5th site. Alexa: with 1,879,000 this has been the only site growing in traffic during the slow down. Analytics: It's our 8th site for traffic (stable, 1.3% of RR), time on site is 27.4% lower than RR, which is great! and bounce rate is 6.1% higher than RR, which is also great! Apartments: it's our 8th site for apartments with 33 of them, down 3 positions due to the Euro focus of the past couple of months, up 14% in two months on inventory which is not bad. Visitors Vs Apartments Ratio: 4.8. This is just gone live but it runs pretty fast. 4,200,000 on Alexa and 32 apartments, all Instants. Alexa: 3,998,000 traffic went tumbling down since we stopped believing in its growth and investing in it. Analytics: It's still our fifth site on traffic (down 1 position and 2.5% of RR), time on site it's 64% lower than Roman Reference, bounce rate is 17% higher. Traffic year on year is down 28%. Apartments: It's our 11th site with 13 apartments, precious little growth since six months, 33% year on year. Visitors Vs Apartments Ratio: is still the best we got: 26! The problem are the deals on sale which just aren't great at this stage. There are 6 more websites, 2 of which brand new, although they're either too slow or too new to mention. Next time! Meet the Cities' team for free drinks and a chat on how it works. Learn how to be a host, list for free and make some extra cash. Contact us for the details and to set up an appointment we can't wait to see you! Owners: we'll launch the new website next week! 2. In the top right header, click the "Sign Up" link. 3. Follow the instructions to sign up for an account. 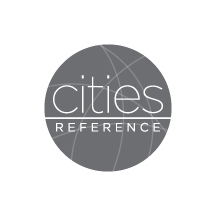 Facebook is fast and easy, but you can also create a Cities Reference account. 5. Click the "Merge Old Account" link on the left side. That's it! 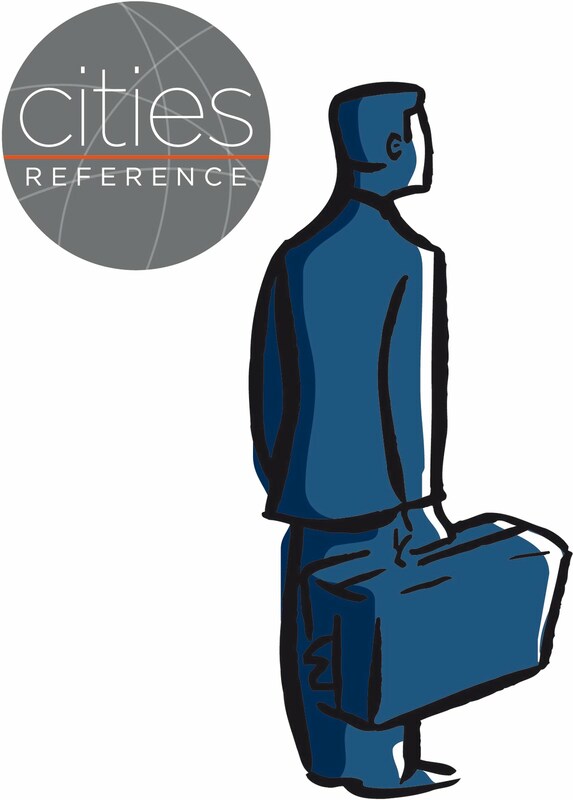 You now have a new Cities Reference account and your apartments should be listed in the dashboard page!